I sat in the sun, uncomfortable amongst poking sticks. A few carp, maybe five, were feeding hard stirring up a mud cloud below my perch on the high bank; but instead of casting I was trying to untangle my fly line from a mesh of twigs. 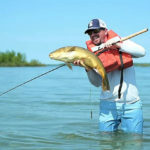 These things can test one’s patience, but the fish were big enough to work hard for. Fly line freed I flicked a Bloody Squirmy up-current and watched it settle near the feeding fish. A youngster rushed to the fly and although I was after the older, wiser carp in the gang, I would’ve been satisfied with any at that stage. It slowed down when it got to the fake worm and then it bolted off and with it all the others. “What…” I was confused. A fly that’s been deadly for nearly three years now was turned down and by a naïve juvenile! I lifted my favourite Berg River carp fly out of the water and took a good look at it. “Nothing wrong there” I thought and reeled the line in. I left the pool feeling defeated, defeated at something that was once really straight-forward, in fact almost a given. I hadn’t blanked on the Berg for a very long time and on that day my fly got turned down by the dozen. The fly that shaped with that thought looked great. It had the best of both, a ZAK-like body, but with natural CDC instead of hackle and a lekker red rubber worm tail. Instead of a hot orange bead, I weighted it lightly with a small black tungsten bead. Convinced that it would catch fish, I filled a row in my box with these for the next trip. The ‘new’, more buggy worm fly for carp. 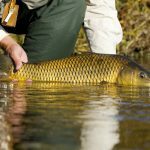 Having had a bad experience with carp on a previous outing, Garth Nieuwenhuis was hungry for more and we agreed to meet at my place for a Berg outing the next weekend. New water is something we’re always looking out for and instead of the usual Paarl centre we headed way down town, beyond the Paarl industrial area and found a place where the bergies were buzzing around us like tsetse flies. There were carp, big, fat ones, but not many. Although not present in abundance, it was still a good time to try out the ‘new’ pattern. I stalked three different fish from the steep banks and all three ate the fly, but I hooked and landed only two of them. 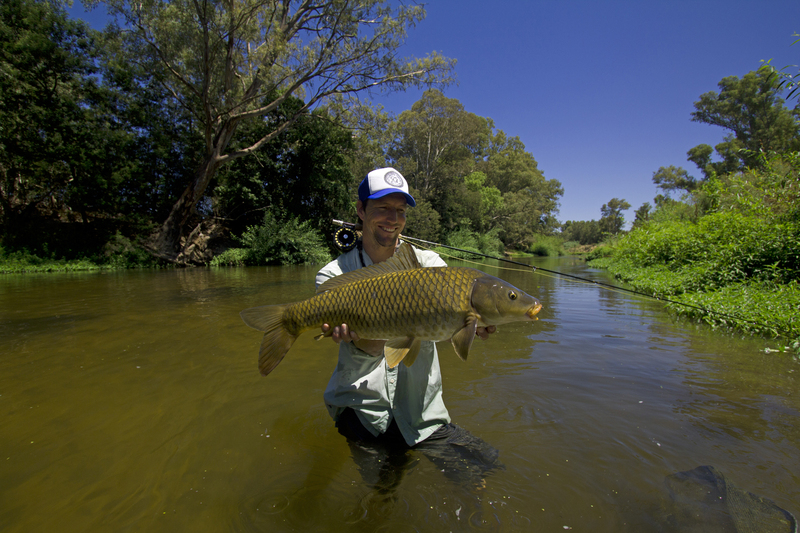 Garth Nieuwenhuis with a lovely down town Berg River carp. Chuffed with the new addition to my cyprinid fly box I took it for a strip at the Paarl cemetery, a stretch in central town where the fish can be extremely spooky. This time I presented the fly to four fish and landed three of them. One was a really nice specimen just cruising the middle of the pool and it ate the fly at pace, not something I’ve seen often. Tie in two strands of stripped peacock herl, one normal strand of peacock herl, a natural cdc feather (strip the fibres off one side of the feather) and a strand of crystal flash – these materials should be twisted into a noodle to shape the body, instead of the standard vinyl ribbed body of the improved Bloody Squirmy. But the question is Leonard: on the day that you went back, and your new Zak-style worm fly worked, did you also try the fly that had spooked all the fish on the previous trip, to see if it spooked the fish again? I have noticed over the years, for reasons that I cannot fathom, that fishes will crap themselves at the sight of a fly one day, but eat the same fly with glee the next, carp and triggerfish are wonderful examples of this. Howsit King Edward, no I didn’t try the ‘old’ fly on those days (why change a fly if it’s working is my general approach), but I did notice a change in behaviour when carp saw the older pattern on a number of trips in the season, but not as bad as the one I described above – that was the final call for me to make a change; fish didn’t eat it aggressively as before, instead they investigated the fly and fish that would’ve chowed it without a doubt two years ago simply turned up their noses. They’ve definitely become wiser. Berg fish were also suckers for a hot orange bead not too long ago, now it spooks them. So, a lighter and more natural fly was the obvious answer in my mind and this time it worked…I wouldn’t be surprised though if I get refusals in the upcoming months. Carp are the elephants of freshwater.